The other side of the ewer features the Goat pattern. This is one of the rarer patterns in the series. There doesn't seem to be any connection between the animals chosen to be printed on either side of the ewer. 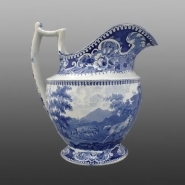 An earthenware ewer printed in blue with the Ferret pattern. 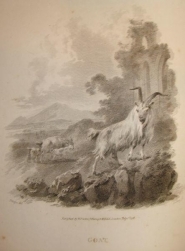 It is part of the Sporting Series by Enoch Wood & Sons. Each item in the series shows a hunted or hunting animals. Here the hunter is a ferret who is used by a rat catcher. The man's sash displays rats along with a crown. He may be a royal rat catcher! This is one of the rarer patterns in the series. To view other patterns in the Sporting Series click here.